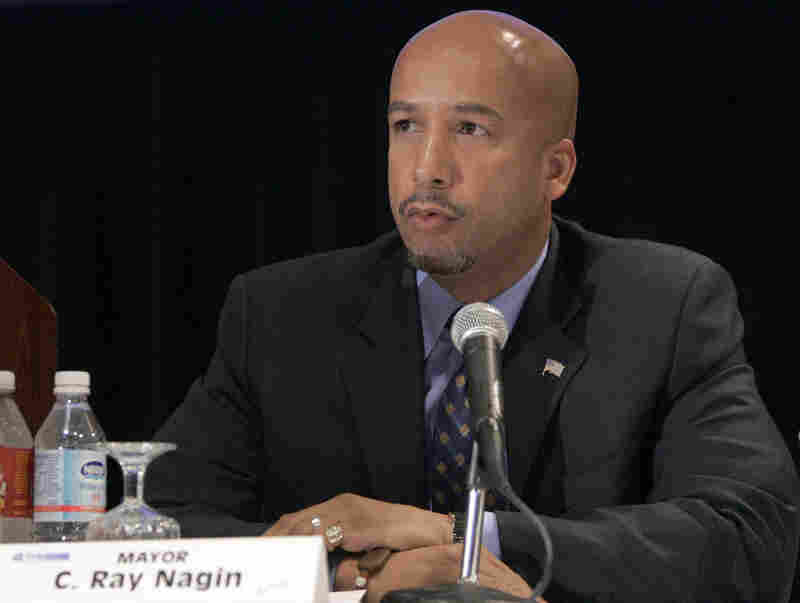 Grand Jury Indicts Ray Nagin On Corruption Charges : The Two-Way Former New Orleans mayor Ray Nagin has been indicted on 21 counts of bribery and other corruption charges by a federal grand jury. When he became the city's mayor in 2002, Nagin, a former cable TV executive, promised to revive New Orleans' economy, and its trust in the city's government. Mayor Ray Nagin has been indicted on 21 corruption charges by a federal grand jury. They include "conspiracy to deprive citizens of honest services." Former New Orleans mayor Ray Nagin has been indicted on 21 counts of bribery and other corruption charges by a federal grand jury. When he became the city's mayor in 2002, Nagin, a former cable TV executive, promised to revive New Orleans' economy, and its trust in the city's government. From New Orleans, member station WWNO's Eileen Fleming reports for NPR's Newscast that Nagin faces charges of "wire fraud, money laundering, taking bribes and filing false tax returns. Nagin is accused of profiting from city dealings.... several businessmen have already pleaded guilty to paying Nagin in exchange for contracts." One of those businessmen is Rodney Williams, who told a federal court in December that he gave more than $72,000 in bribes to Nagin in exchange for help winning engineering contracts. The charges against him include "conspiracy to deprive citizens of honest services." "Despite New Orleans' reputation for political shenanigans, Nagin is the first mayor in the city's history to be indicted by a grand jury on corruption charges," reports The Times-Picayune. As Eileen Fleming reports, "Nagin has consistently denied any wrongdoing."